Onwards to the miles and miles of edging! For those who drew a blank when I babbled about lifelines in the previous post, here are some helpful links. 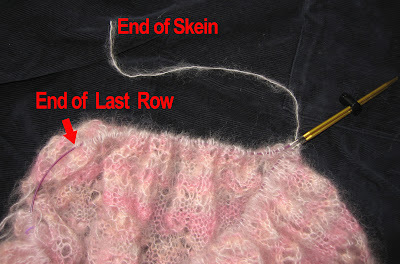 Basically, a lifeline is a temporary thread carried through the row of live stitches. If you make a serious mistake and have to rip back, or you drop a stitch, the lifeline is a lifesaver. You can use any smooth yarn for a lifeline. 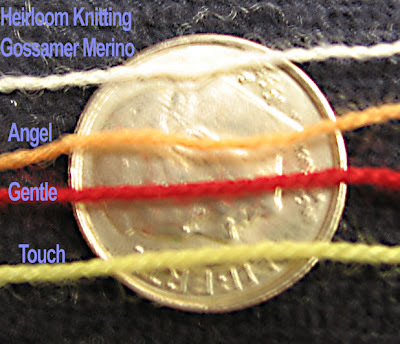 I like silk buttonhole thread myself, but some people use dental floss, nylon thread, or ravel cord, among other choices. While I was searching for lifeline information, I discovered KnitWiki. Clearly, it's just starting up, but could become an extremely valuable resource for all of us. Someone asked for a photo of the pin/lighter process. Here you go. First, stick the pin through the cable. 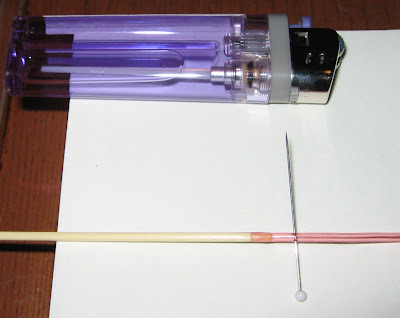 Second, heat the tip of the pin with the lighter for about 5 seconds. Let everything cool (about ten more seconds). Note: Do not touch the pin during the heating process or you will get an uneven and ragged hole. Wonder how I discovered this result. Yes, dear reader, for the remarkable sum of 99 cents (plus postage), I acquired this complete set (size 0-15) of bamboo needles from good old eBay (xiaolingli99 ). They are almost totally worthless. After being released from their highly compressed packaging, several of the points dropped gracefully to the floor, leaving the cables in my hand. Other tips scrambled for the deck while I was untangling the needle glob. The points were, um, erratic, varying from not too bad to really too bad. Wait! Don't go away! There's lemonade to be made from these sour excuses for knitting needles. What attracted me to the set, (aside from the gaily colored cords--I am a sucker for gaily colored cords), was the join. It looked remarkably smooth in the photo and, in fact, this proved to be the case. 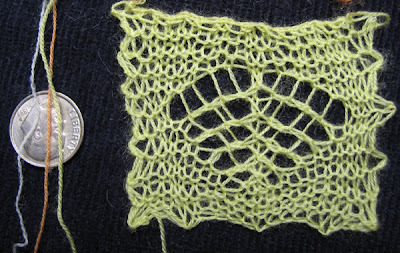 The joins are impeccable--the finest lace yarns slide easily from cable to needle and vice versa. Furthermore, the cables turned out to be cheapo hollow tubing. Hmm. I stuck a pin in the size 0 cable and heated it with a lighter, producing a stable hole suitable for threading a lifeline. 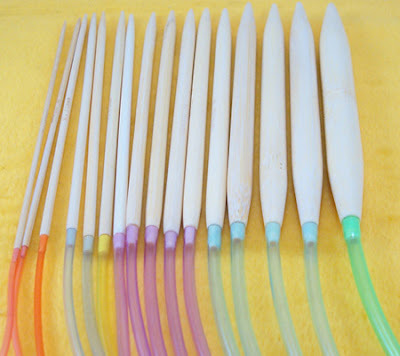 A little glue and a bit of sandpaper on the tips and these bamboo disasters will transform into perfect lace needles. Lightweight, smooth join, sharp tips, flexible cable, and lifeline hole. I tossed out sizes 2-15, so each remaining needle cost a whopping 50 cents. I bought another set. as the manufacturers might "improve" these in the future with a lippy metal join to match the high-priced competition. The Lazy Knitter strikes again. 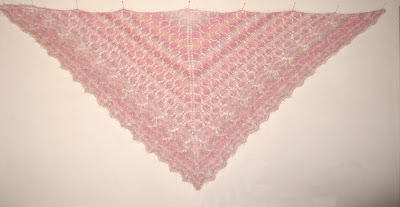 I got so tired of looking up yardage, that I put together a spreadsheet of all the lace yarns I could think of. You can view the HTML version here and download the XLS version here. If you have any additions or corrections, please let me know, and I will update the spreadsheet with new information. 17 rows left on the BWSK border! In the frenzied excitement of swatching for the Princess shawl, I almost forgot about the skein of Touch that Jane had included in her goodie box to me. 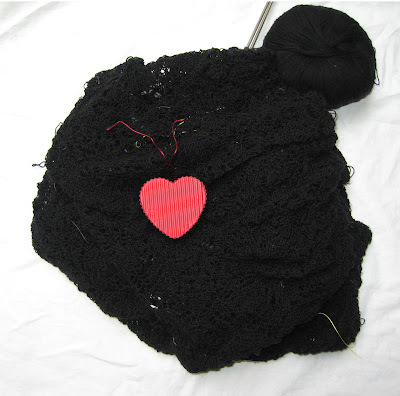 Touch is lovely to both fondle and knit. It's soft and a bit silky, but still has the liveliness that characterizes knitables from the Yarn Place. The composition is a mix of 5% cashmere, 85% merino, and 10% Tencel. The Tencel contributes the silky feeling, cashmere the softness, and merino the springiness. I thought it actually felt a little finer to knit than Gentle, so you might want to take the yards/pound with a bit of salt. I'm sure that Wraps Per Inch are more accurate, but wrapping all these teeny tiny yarns around a WPI thingie will have to wait for that mythical time when I have alphabetized my stash, carefully arranged my needles in pristine order, and cleaned out the drawer in the kitchen with the ten-year-old catalogs. My sample page shows Touch available in nine colors, including the regrettable Split Pea Soup shown here. Harry actually liked this color, which he dubbed "Grasshopper." No accounting for taste, I guess. Finally! I just couldn't take a good picture of it. My room is tiny and has poor lighting to boot. This is the best I can do. I was going to give it away to a friend, but after I put it around my shoulders, I decided to be a selfish fink and keep it. So soft! Utterly cool! Runs from your browser and is FREE!. Go here to play with it. You do have to have the Java plug-in installed. Go here to download it if you need it. Yesterday, I made two more swatches from Jane's gift package and I am happy to report that we have a winner for the Princess shawl! But first, let's do the comparison thingie. 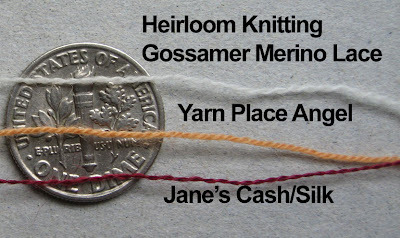 The reigning champion from the first round, Heirloom Knitting's Gossamer merino, returns for a match against two new contenders: Yarn Place's Angel and the Colourmart cashmere/silk that Jane sent me last week. 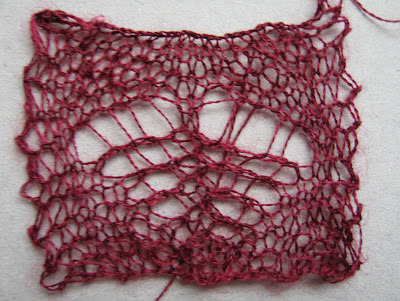 I should add here, because I forgot to do so in the first swatching tournament, that I always test-drop a stitch. If I can't pick it up with a reasonable amount of diligence, I just won't use the yarn. Knitting is supposed to be fun! Pros: Comes in a 15 rich colors, knits like a dream, a dropped stitch hung around while I fished for it, blocks perfectly, and feels softer than cashmere. A perfect 10. Cons: Needs a wider color range so I can buy lots more. 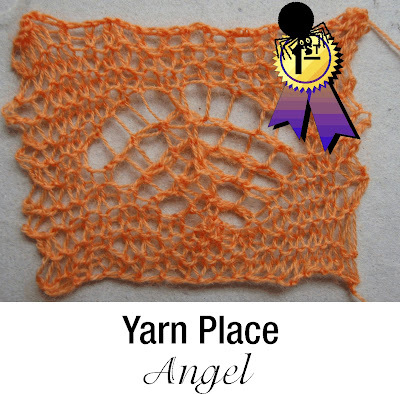 Angel is the perfect extra-fine lace yarn. It's luxuriously soft, comes in an assortment of lovely colors, and is so easy to knit that I did it blindfolded. Yes, I knit the 12 rows of garter stitch in the swatch with my eyes closed and didn't make a single mistake. And it blocks to perfection. While I was working with Angel, I starting thinking about why Angel and Gentle were so appealing to me. The best answer I could come up with is that both yarns have a liveliness on the needle that makes them a pleasure to knit. They seem to be happy to work with me during complex maneuvers, such as P3tog tbl, and if a stitch drops, it doesn't take a swan dive down to the first row. Most of the time, the stitch clings (a bit precariously, it's true) to its current position long enough for me to pick it back up. Without this spirited, bouncy quality, knitting is a chore. 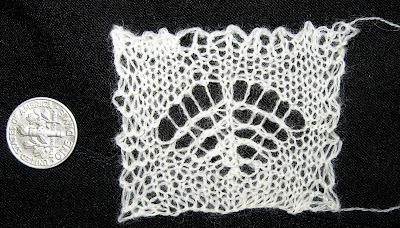 For example, KnitPicks's Alpaca Cloud drove me crazy. There was nothing intrinsically wrong with it, but it just didn't want to cooperate. 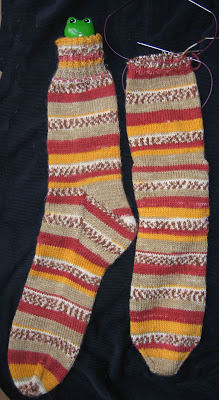 It plodded along the needles and made no effort to work with me when the pattern became complicated. The finished swatch was lifeless. 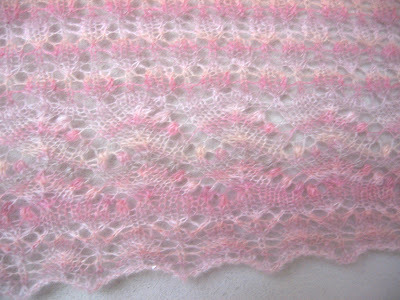 I have used several alpaca lace yarns that were exceptionally pleasant (Fino comes to mind), so the problem with Cloud isn't the content, but the way the yarn was spun. Me, I like yarns with a bit of wool for that indefinable spark of knitability. PS: I tried swatching Yarn Place's Heaven (45% Tencel / 55% Merino cobweb weight, 14,000 yards/lb) and it shredded on the needle. I probably don't want to use this for a Really Big Project. 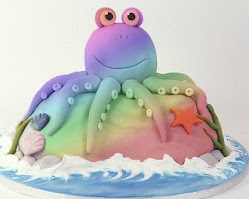 Too bad--the colors are mouthwatering--there's a pink that would be perfect for Princess, sigh. Harry was so thrilled with the samples that he took me out to lunch at a fast-food joint. He ordered a double BugBurger with extra silkworms and declined when asked "Do you want flies with that?" Um. Sorry. This question was actually posed to me at a Tokyo MosBurger a few days ago. I also declined. Five more yards. That's all I needed to finish Swallowtail. Sob. I ordered another ball, but really, what will I do with the leftover 95 yards? This is one garment that shouldn't be worn during hunting season. But if you just have to make it, buy the Fall issue of KnitScene. I'd be afraid to wear one of these fetching outfits in Japan. Someone surely would try to serve me for dinner. 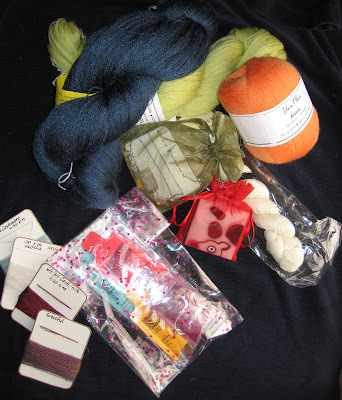 I just received a touching (and touchable) box of lace yarns--both skeins and samples--from Lacefreak Jane. 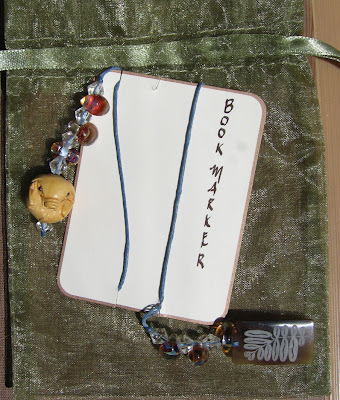 The package included an adorable tape measure, a handmade bookmark, and a lovely note that brought tears to my eyes. I have never gotten such a heartfelt gift from anyone other than my husband, and I am just blown away by it. Roy and I love to give gifts--we think it's fun to find things our friends might enjoy. But it occurred to me when I opened the box this morning, that we rarely ever receive gifts in return. We never expect anything back from our giftees, you understand, but the fact that I received a gift came as a tsunami-style shock. Someone I have never met thought enough of me to (1) assemble a thoughtful, useful assortment of cool stuff and (2) actually send it via Express Mail to Japan. Words cannot express. Thank you, Jane. Of course, Harry, not being the least bit sentimental, immediately dragged everything into his light fixture for close examination. He did allow me to photograph the contents after I threatened him with a 250-watt light bulb (Hot!). 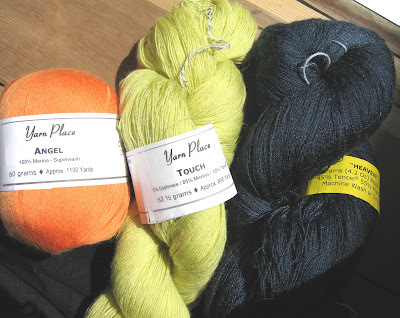 There were four skeins of lace yarn, a Shetland one-ply from Lacis, and three from Yarn Place: Touch, Heaven, and Angel. All feel exquisite and have enough yardage for useful garments, although I don't think I'll be making, say socks, out of the 1-ply cobweb. On the cards are a variety of fine cashmere, silk, and a variegated wool, Graceful (Yarn Place). 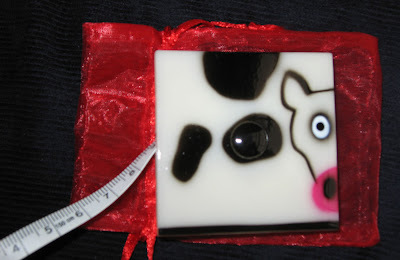 A rate commodity here--a cow tape measure! 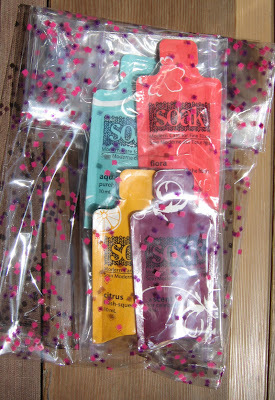 And, in case I get ambitious enough to wash anything, there was a collection of Soak. 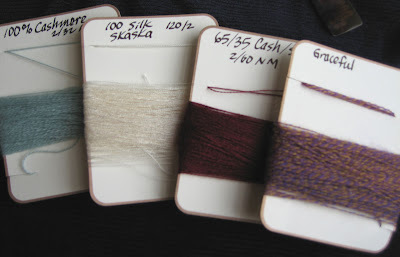 Harry promises to swatch this weekend, so look forward to yet another round of teeny-tiny samples next week. A thrill-a-minute they were not. Sometimes it pays to do a little spring cleaning. I inspected the label. The yarn content is 55% mohair, 45% silk. Rubbed it around my face. Felt like a goose down powder puff. More hmms. Where did it come from, I wondered? I spent some time wandering around the Yuzawaya website, and finally found it here. Notice that there are 220 meters (240 yards) for 756 yen, or $6.20. With my Yuzawaya discount card, the price per ball is $5.58. 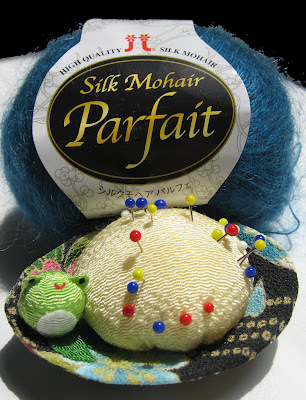 Most Japanese yarns are pricier than their European counterparts, so it's a puzzler how a higher-quality mohair/silk blend can be found here at less than half the price of KSH. Parfait is much softer than KSH, too. For those who would like to order this yarn, or any other Japanese product, please check out Crescent Trading. For a not-too-outrageous fee, they will place orders and send them on to you. All you need to do is supply specific information, a link, or a picture from a website, and they will do their best to find the product. Nice people! And Parfait is still cheaper than KSH, even with Cresent's handling and mailing fee.